Getting children to keep fit and exercise more can seem like an expensive business. After all, there are membership fees, special kit and the petrol costs of getting them to and from fixtures and training. And while it is true that it can be very costly, especially if your child excels at a very specialised sport, it is also true that it does not have to be too expensive to get them fit. Keeping kids fit can be done on a sensible budget. There are plenty of Government schemes aimed at this very thing and even with the cuts announced by the coalition, childhood obesity is still something taken very seriously indeed. And even without such schemes – general keeping fit does not have to be prohibitively costly. The Government, whichever colour it is, has recognised that children need exercise to stay healthy – and that cost can be a barrier to this. So, for all ages of youngsters, there are schemes up and down the country which should give your child access to exercise for a reduced fee, or even free. One such scheme was the free swimming scheme. Aimed at under 16s and over 60s, not all local councils took up the funding but those who did got to offer free swimming for those groups. Although funding for the schemes has now been cut, some councils have carried it on themselves as they realise the benefit. If your council is one, then send your child off for a free swim every week. Other Government funded schemes such as SureStart also offer reduced or free physical activities for children. These are usually aimed at the younger end of the spectrum and they can mean that for little or not cost you can take your child to tumble sessions, baby gyms and other fun and energetic exercise classes. Most outdoor activities cost very little indeed and therefore it’s not hard or expensive to get your children exercising. While it might not be such an attractive proposition in the winter or the rain, much of them time, getting them in the garden kicking a ball round is a great solution to children’s exercise. For something more strenuous, you could go running with them – at their pace, although as they grow older this may be more than their parents can manage! Other outdoor activities require a small outlay but will bring many happy hours of exercising and getting fit for no further cost. Buying a bike and helmet might seems expensive at the time but if the child is going to use it every day, it becomes a sound investment. Second hand bikes, too, are good value – but do make sure you always buy a new helmet. Safety is one area where it really is better to not scrimp. If you are a member of a gym or health club it’s well worth finding out what their policy is on children. Some health clubs are adults only during the week but allow your offspring to use the facilities free of charge at weekends. Others will do very good rates for family memberships, allowing your children to swim and use the gym if they are old enough, for very little outlay. Similarly, why not ask your sports clubs if your children get preferential rates if they join the junior section? 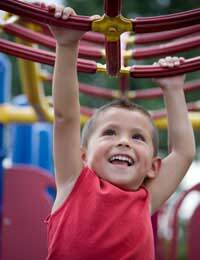 There are plenty of ways your children can get exercise without costing the earth. You may have to realise that if they do get serious about a sport there will be an outlay – not least in terms of your time and effort in carrying them around everywhere. But in these tough financial times, it is well worth noting all the places you and they can all get fit and healthy for free – or at least without breaking the bank.